Can't get enough of American Idol? 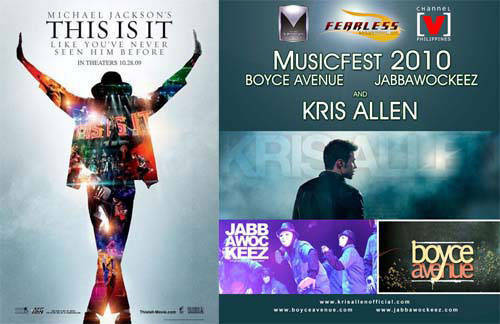 AI alum Kris Allen will be in Manila on February 6 to serenade you, with guest performers Boyce Avenue and the Jabbawockeez. Get your tickets here. The internationally YouTube-famous dancing Cebu Inmates have made it to the big time! Michael Jackson's choreographer, Travis Payne, was in the country recently to teach the inmates a dance number from This Is It for the movie's DVD release. See the performance on YouTube! The Hope For Haiti Now telethon raised $61 million for the earthquake-devastated nation last Friday, and donations are continuing to roll in. It was hosted by George Clooney and Wyclef Jean, and featured performances by Justin Timberlake, Madonna, Jay-Z, Sting, Beyonce, and other music superstars. In case you haven't heard, Kris Aquino and cager husband James Yap are back together under the same roof. The drama is finally over! (For now, at least.) "May commitment kaming dalawa to make it okay," Kris said on Startalk. Speculations were flying all over the Internet, but sources say that gorgeous A-list couple Brangelina have not gone their separate ways. Sorry, Team Aniston, it looks like the golden couple is still here to stay. Talk about major booboos, Drew Barrymore forgot to mention her boyfriend Justin Long in her Golden Globes acceptance speech, and then forgot to mention him again when she picked up a trophy at the Screen Actors Guild Awards! Tsk, tsk. Soul siren Nina's ex-boyfriend, crooner Nyoy Volante, reportedly still owes her a whopping P1.4 million! The singer says he's owed her the money since 2005. Yikes! Did you ever dream of being Jericho Rosales' on-screen romantic interest? Be thankful that those dreams never came true, because Echo says that he'll never court any of his leading ladies! "The best thing is to be able to work na hindi mo pinepersonal ang trabaho mo," the actor says. "Instead of investing personal feelings, invest in your craft, in your work, in friendship." Twilight's Kristen Stewart bruised herself while pole dancing…for a heavy movie role, of course! The young star had a little difficulty with some parts of her role as a 16-year-old exotic dancer in Welcome To The Rileys, but we hear she did an amazing job. The ruggedly handsome Gerard Butler was recently spotted making out in L.A., with a street violinist! Nobody knows the backstory, but the pictures say it all.